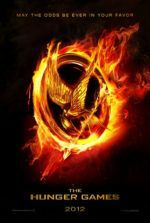 What’s true of both Suzanne Collins’ final novel in her Hunger Games trilogy and the first half of its film adaptation, The Hunger Games: Mockingjay – Part 1, is that they represent a different type of story than the first installments. Far removed from the thrilling dystopian survival tale in The Hunger Games and Catching Fire, the third wades in politics, propaganda, and a call for revolution. Hopelessness and atrocity have ruined various districts. The troublesome yet adventurous games have been canceled. The spirit of rebellion spreads throughout the populace. Indeed, a dramatic shift in tone and manner consumes the narrative of Collins’ last book, the longest and best of the three. 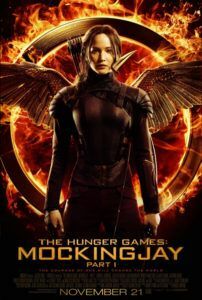 Its story could easily take up four hours of screentime, and so Summit Entertainment follows the Harry Potter and Twilight franchises by breaking the final chapter into two halves, with Mockingjay – Part 2 hitting theaters on November 25, 2015. As a result, there’s no denying that Mockingjay – Part 1 carries a sense of incompleteness as a feature film. As one might expect, it plays like one-half of a larger story and ends on a note so dour, audiences may be turned off by the conclusion, not to mention having to wait another year for the filmic Hunger Games saga to conclude. If audiences felt a profound uncertainty at the end of The Empire Strikes Back, they’ll certainly leave theaters feeling disenchanted here. What’s more, viewers unfamiliar with Collins’ books may feel perturbed by where the film has been bisected for maximum box-office potential. This feeling is only temporary, of course, and will be remedied by the time future viewers watch back-to-back marathons of the Hunger Games series at home. In a way, the open-endedness of the film hurts it; in another way, it doesn’t matter at all. Director Francis Lawrence, who came onto the series for Catching Fire, delivers another excellent, polished blockbuster for fans and non-fans alike. Our hero, Katniss Everdeen, played by Jennifer Lawrence at her most fiery and fragile, serves as a puppet to both sides of the central conflict between the Capitol and the Rebellion. But as always, her own personal, familial and romantic concerns are more pressing. When the film opens, she’s underground in a secret bunker kept by the long-thought-gone District 13 rebels, having been rescued at the end of Catching Fire. Utilitarian and dressed in gray jumpsuits, the rebels reject the excessive lifestyle embraced by the Capitol. 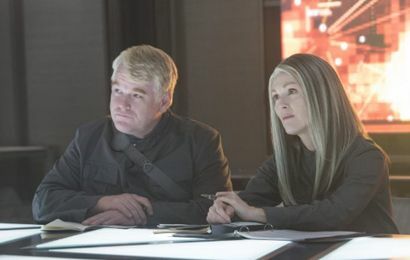 They’re led by President Coin (Julianne Moore), who works closely with Plutarch Heavensbee (Philip Seymour Hoffman) and scientist Beetee (Jeffrey Wright) to employ Katniss as their figurehead in a series of propaganda short films called “propos”, which they hope will incite an uprising across the districts. 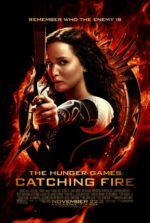 Plagued by nightmares of the games, Katniss refuses to participate in Coin’s plan, until she sees how the Capitol’s President Snow (Donald Sutherland) uses Peeta (Josh Hutcherson), who was left behind during Katniss’ rescue, as his own propagandistic voice. 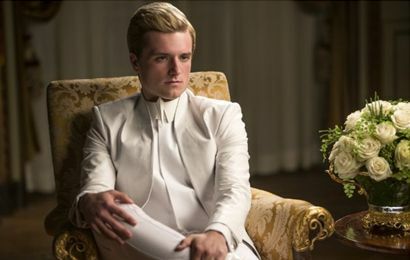 In televised interviews with audacious host Caesar Flickerman (Stanley Tucci), the increasingly tortured looking Peeta begs the rebellion to halt. At the same time, Katniss, none-too-comfortable with her celebrity, is trailed by a rebel camera crew and appears in videos that show the destruction of her District 12 home. She beckons the districts to fight back in inspiring, slightly improvised speeches. Meanwhile, Katniss still feels torn between her militarized, dependable hero Gale (Liam Hemsworth) and her fellow victor, Peeta—although her concern throughout the film is clearly tilted toward rescuing Peeta, making the love triangle element of the plot somewhat underemphasized, save for a couple smooches on Gale’s lips. Mockingjay – Part 1 is all about the power of propaganda. Screenwriters Peter Craig and Danny Strong deliver a fascinating media satire as The Powers That Be use their respective sounding boards as weapons. From start to finish, the theme of power-plays, moves and countermoves, and mass manipulation courses through the film, interrupted by a few hints of action to alleviate the subterranean atmosphere. And just like the Hunger Games themselves, Katniss and Peeta become objectified tools of misinformation, employed by two equally domineering powers. Both Presidents, Snow and Coin, use their positions to garner control—Snow through fear, and Coin through an oppositional, functional order. As a leader who organizes a fallen people, Coin cannot help but resemble Adolf Hitler and her machine-like demonstrations, ordered and uniform, complete with “hoo-rahs” and arm waves that recall “sieg heil”. Those who recognize this parallel should be keen to remember that Collins’ books were in the first person, and the greater struggles of Panem were never more important than Katniss’ inner conflicts. As Katniss, Lawrence is wonderfully nuanced in her performance, delivering comically awkward, uninspired lines when her character is forced to act in front of cameras, and then later burns with all the fire of her Mockingjay insignia when she witnesses the Capitol’s cruelty first-hand and demands to fight back. She’s helped along in her mouthpiece duties by toned-down versions of Haymitch (Woody Harrelson) and Effie Trinket (Elizabeth Banks), the latter of whom is forced to dismantle her outlandish robes for a plain-Jane look, while the former must abstain from drink per Coin’s rules. Hoffman is particularly good when his character struggles to get Katniss to perform, giving his Plutarch a touch of obsession toward the way his rebel media spins, well, everything. Also excellent is Sam Claflin, whose game victor Finnick Odair experiences the same degree of post-game trauma as Katniss. Under-represented is Jena Malone’s show-stealing turn from Catching Fire as spirited victor Joanna, who appears only briefly in cameo. Overall, Mockingjay – Part 1 has a unique set of goals compared to its predecessors, but director Lawrence doesn’t disappoint in elevating the series as a whole with this political-minded entry. Just as with the previous film, he and cinematographer Jo Willems render a top-notch production that looks slick and never devolves into the unintelligible Shaky-cam lensing of the first. But its the narrative thrust of the story and its ensemble cast of performers that make this film stand out. After all, how many Young Adult films involve a plot driven by the notion of entertainment or news as propaganda? Any film that gets youngsters (or oldsters, for that matter) to think about what they’re being fed on the idiot box deserves kudos. 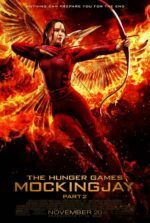 Mockingjay – Part 1 just happens to do this in the middle of an ongoing saga whose rousing, fatalistic conclusion cannot come soon enough.